Perennials are versatile, beautiful and important to the landscaping industry as well as the nurseries that grow and supply them. Perennials are very popular with gardeners mainly because in this group of plants you will discover the toughest and yet most beautiful examples of garden plants. There are opportunities in this field for knowledgeable people with a passion for perennials, to propagate, grow and advise clients on their cultural requirements and how to use them in their gardens or public parks. "This course will give you the opportunity to become an expert in this field. Perennials are gaining popularity - many are dry garden tolerant and as a result many people are showing an interest in growing and learning about such a diverse range of plant species. A great fully rounded course covering diverse aspects of plant growing." - Gavin Cole B.Sc., Psych.Cert., Cert.Garden Design, MACA, ACS Tutor. Botanically speaking, a perennial is any plant that lives for more than one or two years. This includes trees and woody shrubs, but most gardeners think of perennials as small flowering shrubs such as geraniums and Marguerite daisies, and herbaceous soft-wooded plants that die back each winter, such as hellebores, campanulas and aquilegias. Herbaceous is a general term to describe those plants that do not have woody growth. Some herbaceous plants retain their foliage all year and many others have a period of dormancy. These plants often store food in a part of the plant below the ground. They include bulbs, corms, tubers and rhizomes. Plants like these provide some of our most spectacular flowering displays. Some are very fragrant, many others are not.. Planted in single varieties in massed beds for a formal appearance. Interspersed with other plants in the garden bed in clumps or drifts for an informal effect. Planted under deciduous trees in random groups to create a naturalised 'wild' garden effect. 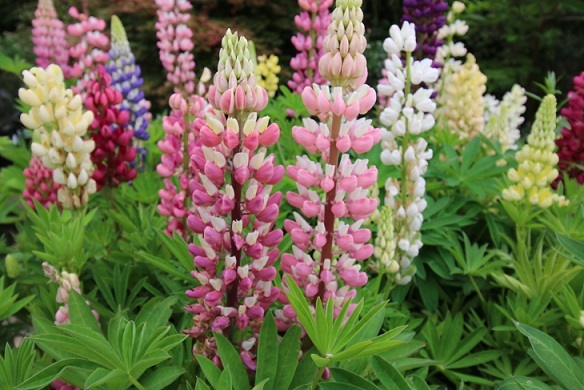 When selecting herbaceous plants, consider how they will look all year round. For many months, they will be dormant and unseen. They also need to be left to die back after flowering, when they can often look unattractive. To be grown at their best herbaceous plants require careful maintenance. Perennial displays use a great deal of water and nutrients hence soil conditions need to be the very best at all times. Some do like shade but the majority prefer sunny positions. Does it have any particular problems which should be treated? Hard clay soils need to be loosened – you can do this through cultivation (digging), by adding soil conditioners such as gypsum (as appropriate), or by incorporating organic matter such as well rotted manures and compost. Sandy soils can dry out too easily or be low in nutrients - overcome these problems by adding well-rotted manures or compost, or wetting agents. Add generous amounts regularly to maintain structure, water-holding capacity, and fertility. Check the soil’s pH level (the degree of acidity or alkalinity). Simple test kits are readily obtained from nurseries, garden centres, or other suppliers. Most plants prefer a slightly acid or neutral soil (pH of about 6 to 7). Most perennials tend to be very adaptable to pH and will still grow well in pH levels just outside this range. Once you know your soil’s pH you can either choose plants that like the pH of your soil/growing media (this is the best option), or you might alter the pH to suit the plants you wish to grow. The pH level can be raised by the addition of lime, or lowered through the addition of acidifying materials such as manures, sulphate of ammonia, or sulphur powder. On exposed sites, it may be necessary to provide windbreaks or to channel wind with fences or planting. Planting protects tender plants but still ensures good ventilation. Be careful though, if the garden is totally enclosed air movement is restricted and that can result in an increase in diseases. All weeds should also be removed from the site prior to planting. If you use weed killers then there will also be a waiting period before the soil is safe to use. For shady sites, select plants to grow that prefer, or will tolerate, periods of shade. You can always find suitable shade-tolerant plants to fit in with a planting scheme or garden design. Healthy plants are more likely to resist damage from pests and diseases, and more likely to recover if they are attacked. The roots and top growth of the plant should be well developed. There should be no deformed growths (e.g. twisted, distorted leaves, swellings on roots). Avoid plants with badly marked leaves. Unusual growth patterns can indicate a genetic deformity, viral or bacterial infection, or perhaps represent evidence that the plant has been poorly nurtured. A plant with unhealthy growth is less likely to thrive. Seeds and bulbs should also be fresh and free of abnormal markings, or any rots.